Are You in Need of Air Conditioning Repairs? As the weather warms and we start to use our air conditioners, the time to schedule maintenance (if you haven’t already done so) is now. This is the only way to ensure that you’ll be going into summer with a fully functional and efficiently operating air conditioner. Additionally, it will give you the chance to take care of any need for AC repair in Salt Lake City that might come up during your tune-up. Regardless of whether you’ve had maintenance done or not, though, it’s a good idea to be aware of any signs of trouble. But how do you know what to look for? Well, we’ve put together a brief description below of some common warning signs that can indicate something is amiss with your air conditioner. If you notice any of these signs, be sure to call our team right away. After all, the sooner you tackle problems, the better! Posted in Air Conditioning | Comments Off on Are You in Need of Air Conditioning Repairs? Why Is Water Leaking from My AC? Nobody wants to face a leaking air conditioner. Not only is this typically indicative of a huge problem with your cooling system, but you could experience water damage on your property. Naturally, if this occurs it’s safe to assume it’s an emergency situation and you should call a professional right away. However, understanding why there is water leaking from your air conditioner may help you prevent it from occurring in the first place. Why does water leak from air conditioners? How can you prevent it from happening again? We’ve tackled these questions below. Posted in Air Conditioning, Air Conditioning Repair | Comments Off on Why Is Water Leaking from My AC? It is not uncommon for homeowners to fire up their air conditioning systems during the early days of the cooling season, only to find that their air conditioner is not performing at the level they recall. It is best to have any problems with your air conditioning system evaluated, diagnosed, and resolved before the real heat of summer is well under way. Putting off repair needs can lead to further complications down the line, and you’ll find that the further you get into the summer months, the busier technicians are. Familiarize yourself with the following information, and schedule air conditioning repairs in Salt Lake City, UT at the first sign of trouble from your AC. Contact Design Comfort today if you need to have your cooling system repaired. Calling a technician for AC repair may seem like a hassle, but it’s sometimes a necessary step in owning an air conditioner. If you want your air conditioner to last for years to come, it’s important that you pay attention to the signs that your AC is not in top shape. Whether you hear strange sounds from your unit or notice your home is not quite as cool as you’d like it to be, it could signify major damages. When you run into any problem with your unit, it’s important to schedule air conditioning repair right away, for the following reasons. Reduce the Chances of a Breakdown: One of the worst feelings on a hot day is coming home to a broken AC. Even if a repair need seems minor now, it can develop into something big, causing your unit to become overworked and, eventually, to break down entirely. Increase the Lifespan of Your Unit: An air conditioner is a big investment, so you want it to last for many years to come. However, problems with your AC could put strain on the most important components, such as the compressor, which may mean your unit needs to be replaced prematurely. Save Money: Sometimes, reduced cooling indicates a problem that is fairly simple for a trained technician to correct, such as a dirty condenser coil. But this seemingly minor issue could cost you more every month on your energy bills. Whenever your unit has to work too hard to compensate for damages, you’ll end up paying a price. Scheduling repairs at the end of summer may be frustrating, but there are a few steps you can take to ward off trouble. Cleaning or replacing the air filter is a great way to restore some efficiency to your AC and ensure proper airflow to the evaporator unit. But you should also be sure to schedule maintenance once a year. During maintenance, a technician cleans many parts of your AC and may make some adjustments as needed, keeping repairs at bay. The technician will also let you know if your unit has any problematic components that need repair or replacement. 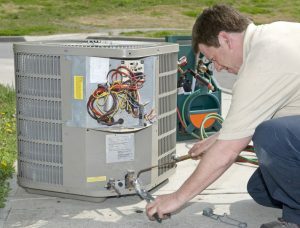 For air conditioning repair service in Salt Lake City, call our team of highly skilled experts at Design Comfort today! What Does That Noise Mean? In the summer, trouble with your air conditioning system can be alarming. A sudden breakdown can inconvenience you and cause your family a lot of discomfort. When your air conditioner makes strange noises, you may be unsure as to whether the problem is urgent. But if you’re worried about sudden breakdowns, you should treat any and all noises as troublesome. Call an air conditioning repair service at the first sign of a problem. While a noise may indicate a minor repair need, that same noise may also be a big deal. Here are what some of the most common noises indicate. Banging: A banging noise may mean that there is a loose component somewhere inside your air conditioner. If you hear banging inside of your home, it could mean that a blower fan blade is loose or damaged. This could interfere with the amount of airflow over the evaporator coil, which may cause it to freeze. If you hear this noise outdoors, it may mean there is damage at the condenser fan, or it could indicate loose screws or other hardware. However, this noise may also indicate a problem with the compressor. Compressor damage should be looked at as soon as possible, so it’s best to call a professional right away. Hissing: A hissing noise often indicates low refrigerant. The refrigerant in your system must stay at a set level in order to properly remove heat from your home. If this level drops, heat exchange may not take place, and you may feel no cool air in your home. Besides limited cooling, the components of your air conditioner may be affected as well. The parts of your AC are meant to hold a specific level of refrigerant and any change could cause them to overwork, damaging your system. Buzzing: A buzzing noise usually indicates an electrical problem. You should never attempt to repair an electrical problem without the help of a qualified technician. When you need air conditioning repair service in Sandy, it’s easy to find an experienced technician who can diagnose and repair your system. Just call the experts at Design Comfort at the first sign of trouble. Posted in Air Conditioning | Comments Off on What Does That Noise Mean? Of the various things that can go wrong with an AC, some are less subtle than others. Loud, grinding sounds, major water or refrigerant leaks, and failed compressors are all obvious problems when they occur because the result is often a total lack of system functionality. But others are far more subtle. Most of the problems with your HVAC system begin as very minor issues, which are more within the realm of maintenance than repair, but when neglected, they can develop into costly repairs and premature replacements. At Design Comfort, we have seen plenty of HVAC problems and have been offering solutions for years, and we’d like to share with you some telltale signs indicating that you need professional air conditioning repair services in Salt Lake City. Call us today to learn more about what we can do for you. Catching problems early is important. Here are some things to look out for. High electricity bills. We know that you have probably already keep a close watch on your energy bills, but pay close attention to your electricity bill during the cooling season to monitor any spikes in usage. If you haven’t changed your cooling habits from one month to the next, then you shouldn’t see an increase in cost, all other things being equal. Frozen coil. If you find that your indoor evaporator coil has frozen over and continues to accumulate ice, then it’s an indication that your system needs professional repair. When this occurs, it leads to all sorts of problems, from a lack of cooling to an overheated compressor. While defrosting is the logical step, it may not get to the root of the problem, which could be low refrigerant or blocked air flow. Hot spots.When you walk throughout your home, is the cooling even and continuous? If not, then you have hot spots, which are often an indication that something is wrong with your AC. There could be an isolated problem to do with your ductwork in a certain part of the home, but it could also be a problem with the actual components of the AC. Call Design Comfort today for professional air conditioning repair services in Salt Lake City. We’re here to help. Air Conditioning Repair: Why is My Air Conditioner Noisy? During the hottest time of the year, the last thing you want to worry about is a problem with your air conditioning system. Unfortunately, like any other mechanical system, you are going to have occasional issues with your air conditioner. When you do, the best course of action is to call your Salt Lake City air conditioning repair technician as soon as possible. We frequently receive service calls for air conditioning systems that are making unfamiliar sounds or are very noisy during operation. Here are a few possible causes of these issues. Call Design Comfort today if you are concerned about noises that your AC makes. If you hear a buzzing sound coming from your air conditioning system, it may be an issue with the electrical components in the system. Any time there is a problem with an electrical component, it is important that the issue is resolved immediately. Contact a professional Salt Lake City air conditioning repair technician to ensure that your AC is operating as safely as possible. A clicking sound may be the result of a damaged fan blade within the system, or even a faulty thermostat that causes the relays to trip frequently. In either case, damages may result if the issue is not promptly resolved. Sometimes the sounds that you hear coming from your air conditioning system are the result of the ductwork, not the AC unit itself. Ductwork may amplify and resonate sounds coming from the system, or it may work free of a binding and clang or bang during operation. Hissing or bubbling, which results from leaks in refrigerant lines, or a popping coming from flexing or contracting ductwork. The bottom line is, there are a great number of possibilities as to why your air conditioning system is operating noisily. By scheduling routine air conditioning maintenance you can minimize the risk of damage to your system. At the first sign of trouble, give us a call. Design Comfort is the company to call for all your Salt Lake City air conditioning repair service needs. Let us know what concerns you have about the operation of your air conditioning system. Our professional Salt Lake City air conditioning repair technicians will find the solution necessary to resolve the problem. Posted in Air Conditioning | Comments Off on Air Conditioning Repair: Why is My Air Conditioner Noisy?